On platforms, drained risers are often used in conjunction with an air release valve (and / or an overboard dump valve) for submerged firewater pumps. The flow through the pump can build quickly as the air is vented, and this high flowrate is then stopped when the air valve (or dump valve) closes, leading to a large surge pressure rise. We have studied several systems where significant damage to piping and supports has been sustained. Our software can accurately model this flow build-up, taking account of the air compression and evacuation, and assist in correctly sizing the air valve, or to find other means of preventing unacceptable conditions. Large areas of pipework in firewater systems, such as deluge piping, remain drained until needed. When called upon, this pipework needs to be primed and pressurised as quickly as possible in order to deliver water to fight the fire. It is common for the priming to take place at high velocities, and again, we have studied many systems where damage has been sustained, particularly when the last sprinklers in the deluge system prime. Our analysis will determine the most cost effective means of reducing the pressures to an acceptable level. Our mathematical model takes into account all of the individual outlets from the pipework for both air and water flow to accurately reflect the priming of the system. Closure of deluge valves can often take place rapidly, leading to surge pressure problems. Our mathematical model can consider the closure of valves at different stroke rates to determine the minimum safe closure time for valves. High level pipework, such as helideck or accommodation pipework, can experience low pressures when firewater demands are made from the ringmain. If the pressure falls sufficiently low to generate vapour pockets, then the subsequent collapse of this vapour can lead to large pressures and forces on the pipes. Our model can determine whether vapour formation is likely, and if so establish a method of reducing the pressures to an acceptable level, or preventing the vapour formation. The mathematical model can be used to consider the behaviour of the system under steady and transient conditions, to determine control valve settings and pump start or stop sequencing to ensure that the system may be operated safely under all conditions. 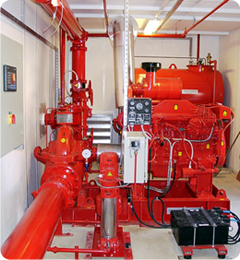 We will typically model events such as routine testing of firewater pumps, shutdown of firewater pumps and operation of monitors, hose reels, hydrants and deluge systems. The model output can include the maximum forces acting on all pipe sections for stress analysis / pipe support design. Note: Hydraulic Analysis Limited do not provide stress analysis or pipe support design services.